DAVISON — Rita Lang has always enjoyed practicing medicine in unique ways, helping those who might otherwise not receive proper healthcare. 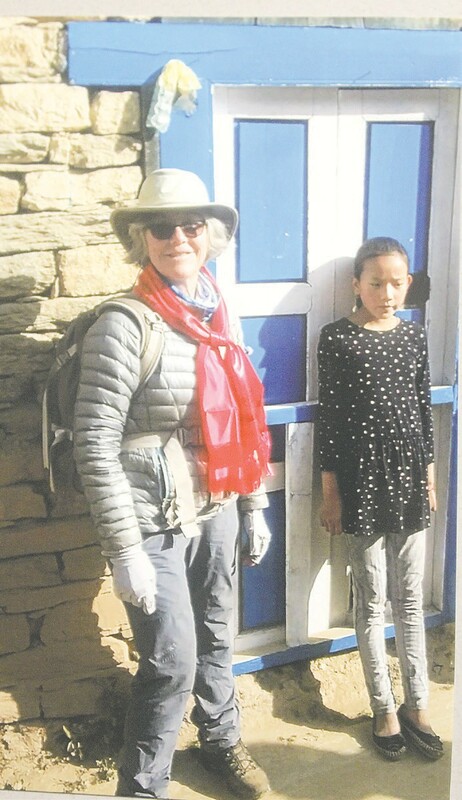 As a member of the Wilderness Medicine Society, the 67-year-old retired doctor from Davison, recently took a trip to Nepal, where she found herself practicing medicine in remote villages after being helicoptered in from the Base Camp at Mount Everest. Lang said she has been involved in wilderness medicine since the 1980s and has a degree in environmental education, followed by medicine. Lang said her first trip aboard was to Roatan, an island off Honduras. A photo Rita Lang took of the Tengboche Temple with the Annapurna Mountain in the background. As a member of the Wilderness Medicine Society, she said she spends two weeks a year as a volunteer at the Rocky Mountain Biological Laboratory and Research Station in Gothic, Colorado. Lang said she had a medical practice for 35 years in Lapeer but retired three years ago. Now she works at a Lapeer County medical care facility as a hospice medical care director. Lang just returned from a two-week trip to Nepal, Nov. 5-18, where she spent time trekking to local villages to help staff clinics there where the doctors could administer health care to the local population. 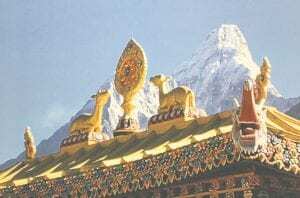 She said the physicians and medical personnel traveled from Katmandu and from there to the city of Lukla, before hiking on to the Mount Everest Base Camp. Lang said she was the second oldest person on trip, but she said she made it a point to make the trek to the base camp on her own. From the base camp the medical teams took helicopters in conjunc- tion with trekking to go into villages around Mount Everest and to set up clinics to provide medical care for locals. Lang said people were beaming to see the doctors and always seemed happy. Lang said the founders of the Wilderness Medicine Society are working right now to build a hospital in Nepal which, when open, will help meet the needs of the local population. She said the hospital will be the crowning achievement of the doctors when it is complete in November 2019. Dr. Paul Auerbach of Stanford University established the Wilderness Medicine Society with the intent of training physicians who live in remote areas to be prepared in emergency situations. He has been aided by Dr. Luanne Freer, head physician at Yellowstone National Park. Both, said Lang, have been to Nepal 30 times, adding Freer set up Everest Emergency Room with the head Sherpa for the group, Wongchhu Sherpa. “They were the leaders of the trip I was on,” said Lang. “(Wongchhu) did all of the set up for the Everest ER in 2003 and onward. His trekking group brought in all of the medical supplies and tents to basecamp. She explained that Wongchhu Sherpa was an orphan in Nepal, who educated himself and went on to own the premier trekking company in Nepal. He put his money back into the village he came from – bringing in roads and electricity. He died several years ago from colon cancer, but his dying wish was there would someday be a hospital in Nepal. Together, Auerbach and Freer, with the help of Dr. Eric Johnson, promised to complete the hospital. The three of them now raise funds to make that dream come true, said Lang. One way the Nepalese people are helping raise funds for the hospital is a children’s book called Musa Masala – written by a 9-year-old girl. Lang said the team took the books into the villages with them, carried in packs on the yaks they used while trekking from place to place. Lang said the book is meant to be read in classrooms and proceeds from book goes to construction of the hospital. She said if any local schools would like to have her visit and read the book to a classroom, or to talk about her trip to Nepal, she can be contacted at Reetz625@aol.com. Overall, Lang said it felt good to go somewhere where her aide was appreciated.